I like the ATtiny85. It is small, comes in a solder friendly DIP 8 case, has 8k Flash + 512 Bytes Ram, 5 to 6 IO pins at 8 MHz with no external parts. But developement is a pain: no serial (ok, it is possible but needs ports) and debugWire is even more pain. So how to approach this problem? Throw money at it. Use MicroView. MicroView is a chip-sized Arduino compatible module with an on-board 64×48 pixel OLED display. It has to be programmed with a special USB adapter. With its small size it is optimal for using in small environments. And it has a breadboard friendly DIP form factor. It is expensive. $40 per item. And a one time fee of $15 for the programmer. So nothing for eternal to build into each and every mini project. Replace it by a ATtiny85 after debugging the code. Yeah, it has a different footprint. A adapter is needed. That is what this page is about: the MicroView to ATtiny85 adapter. It is a very simple small PCB with no parts on it beside some headers. Project info at Lembke.eu page. 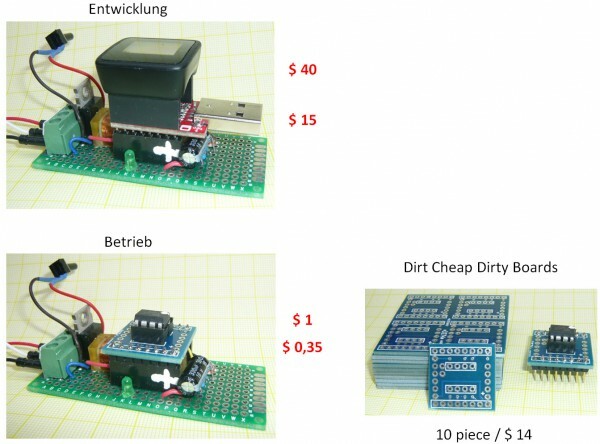 This entry was posted on Thursday, May 7th, 2015 at 12:57 pm	and is filed under Arduino, DirtyPCBs.com. You can follow any responses to this entry through the RSS 2.0 feed. You can skip to the end and leave a response. Pinging is currently not allowed. I’ve done many PIC12F projects, I don’t see why developing for an 8-pin MCU is so hard. Once you can (a) blink an LED, and (b) have a basic working C template, and (c) test a few peripherals on one of the MCU on a breakout board so that you have some generic peripheral code snippets that work, then: any project is just a few quick cut-and-paste jobs and some minor coding work. Yeah, you are right. He could send the entire debug Messages with a simple LED, morse code isn’t too difficult. Ha ha… :-) Okay, an oscilloscope for more complex waveforms. Or sometimes the built-in simulator in the case of Microchip PICs. Too many noobs, that’s the problem! I once meet a guy who wanted to control the ignition timing of his 2 stroke piston engine by a Attiny85. I could imagine it will be a real pain to get data out of the ’85 in a motor shop environment. And debug the situation and see what is happening right now. And after that move to the final solution without building something new. So the idea to do it with something like that adapter doesn’t sound too bad to me. I’d go the other way and make an adapter that fits the microview into the 8 pin DIP socket for your ATTiny85 if that is the final chip you’ll be using. Your PCB will be smaller and you don’t need the adapter + pins in the final device so it’ll be quicker + easier + cheaper. PWM is the most awesome debugging tool one can use. Equipped with a piezzo it replaces UART and OLEDs in most cases, thus introducing virtually no overhead within the code, RAM or MCU time. For more complex situations the code has to be tested on atmega328 of course. I was frustrated with Attiny as well for a project but ended not using it. But because of my test with it I ended up making this: http://friedcircuits.us/39 Makes your life a lot easier. Allows programming and serial from the Attiny. And tuning the oscillator for serial, otherwise doesn’t work so well.